38 pages | 24 Color Illus. - the importance of maintaining standards in dwellings that are currently decent. Foreword by Grainia Long, Chief Executive, Chartered Institute of Housing. Executive summary. 1. Introduction. 2. 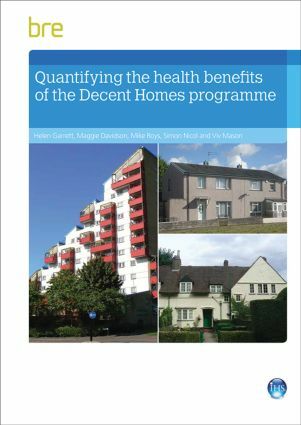 Overview of methods and background - Decent homes, Housing Health and Safety Rating System (HHSRS), Links between HHSRS and Decent Homes. 3. Estimating the actual reduction in hazards between 2001 and 2010. 4. Estimating the cost of work required to make homes decent. 5. Estimating the reduction in costs to the NHS. 6. Additional costs to society of non-decent homes and the benefits of improving them. 7. What is left to do - Costs and benefits of dealing with remaining Category 1 and Category 2 hazards, Keeping homes decent, Non-decent homes in the private sector. 8. Conclusions. 9. References. Appendices.